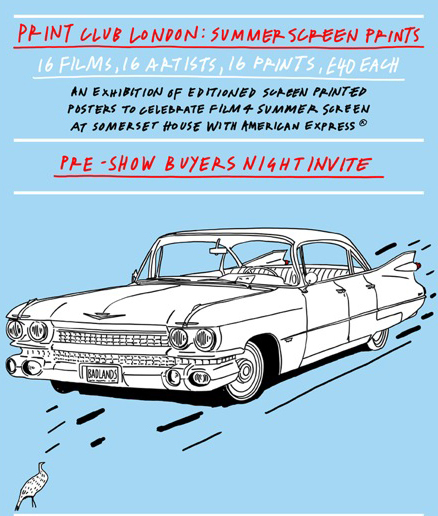 To coincide with Film4 Summer Screen at Somerset House with American Express®, Print Club London have been invited to curate a screen printed poster exhibition using the same approach and style as their successful and highly anticipated annual “Blisters” shows. This special collaboration will see some of the most talented and innovative illustrators from the UK and USA design and produce 17 new and original screen prints, inspired by the each of the films screened this year. All the prints will be produced in limited editions of 200, signed by the artist and available to buy at £40 each. The exhibition will be open daily until late throughout the Film4 Summer Screen at Somerset House season. The Exhibition opens on 31st of July with a buyers night and will then open to the public form the 1st till 20th of August. If you would like to attend RSVP to rsvp@printclublondon.com The event will be in the West Wing Galleries.